Changing your hairstyle can make you feel like a new person. Whether you’re starting a new job, a new relationship, taking a holiday or you’re ready to show off a new attitude, we can create a brand new style that will bring out the best in you. You can get a blow dry for volume. Have your hair curled or straightened. Get a dramatic short cut, a sophisticated up-do or extensions. Change your all over colour or go for highlights – subtle or dramatic. When you’re ready to look in the mirror and see a new you, come to our salon in Exeter for a consultation. Your hair stylist will help you find a style that makes you feel great about yourself, that’s comfortable for you and that you can maintain. She’ll consider your skin tone, your hair texture, your face shape, your lifestyle and the amount of time you’re willing to spend on your hair. From there, your hairdresser will create the style that’s perfect for you. She’ll show you how to maintain your look until your next visit, using products from our Gandy Street salon that nourish and revitalize your hair, keeping it healthy, strong and beautiful. 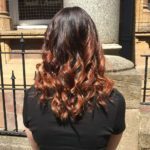 Make an appointment today at our Exeter hair salon and find out what a restyle can do for you. Alternatively give us a call on 01392 499162, and speak to one of our friendly team and we will give you our expert advice.